The Keweenaw was home to people long before it became an entryway – and destination in itself – for thousands of European explorers, traders, missionaries, and immigrants. As with the study of any ancient human group, speculation abounds about their identity, but what is known for certain is that the earliest occupants of this peninsula were ancestors of today’s Native North Americans (NatAm 1). Archaeological sites dating from approximately 7,000 years ago suggest that people have lived in the Keweenaw for at least that long; the copper items they left behind represent the oldest evidence of metal mining activity in North America (NatAm 2). The Ojibway arrived in the western Great Lakes by the early sixteenth century; seventeenth century explorers’ written accounts provide information about them and offer insights into their landscapes, history, culture, and the early years of contact with Europeans. Eighteenth and nineteenth century records further describe interactions with fur traders and missionaries, and document the gradual displacement of the Ojibway by European and American miners and settlers. It has been said that “[h]istorians and anthropologists alike recognize that Indians and non-Indians are caught up in a process of historical change that is rapid and endless and that there can be no isolation of one group from the other (NatAm 3).” This recognition is particularly apt for discussions of the Keweenaw, where, despite their long-standing occupation of the region, Natives remain marginalized in historical research and literature (NatAm 4). To date, historians have overwhelmingly focused on late nineteenth and early twentieth century industrial development, and published scholarly sources that deal explicitly with the region’s first inhabitants are few and far between. Examining Native American history in the Keweenaw is challenging, but increasingly important as we interpret our shared past. What follows is an attempt to introduce a more inclusive approach to the history of the Keweenaw through surveying secondary sources; analyzing primary sources is beyond the scope of this paper. Look for a book about the Keweenaw’s history and you will find several that examine the events of the last 150 years in detail, and with good reason: its copper industry includes compelling stories of exploration, triumph over adversity, and inevitable decline. Local authors like Clarence Monette uncover specific subjects and places. Scholars such as Larry Lankton, Charles Hyde, and Arthur W. Thurner have produced broad, thought-provoking analyses of the technological, economic, and personal forces that determined the industry’s rise and fall (NatAm 5). However, discussions of the history of Native occupation and land use are brief and contain few variations on the following themes: the name of the peninsula is derived from the Ojibway word meaning “place of the crossing,” or portage; the mining companies used “ancient Indian diggings” as signs of copper-rich ground; and the identity of these ancient miners is shrouded in mystery. Treaties are explained for their role in obtaining land for American mining interests, not in terms of their impact on Native culture. That being said, it is important to recognize that Lake Superior mines have themselves been under-studied relative to other districts in the United States – a surprising situation, given the attention many other mining locales have been given. Lankton’s effort to address the Keweenaw through the “social history of technology” stands out in the literature (NatAm 6). At the local level, where most of the research into the Keweenaw is undertaken, scholars investigate more detailed aspects of its history, including: company-built houses; streetcars; amusement parks; milling operations; and individual ethnic groups. Comparing the dearth of published and unpublished sources about Natives to the richness of other themes, one cannot help but think that we are missing the historical forest for the trees. If it is true that Native and Euro-American history cannot be isolated from one another, than the history of the Keweenaw has yet to be written. There is some conjecture about how the Americas were first populated. The best-known theory is that advancing glaciers lowered ocean levels enough for people to walk across the Bering Strait, which separates Alaska from Siberia. From there, they migrated southward through an ice-free corridor between the two main glaciers that covered North America – the Laurentide in the east, and the Cordilleran in the west. Exactly when this happened is uncertain, but archaeological evidence suggests that it may have been as early as 22,000 years ago (NatAm 7). Some researchers, using linguistic evidence, suggest that people also traveled in boats down the glacier-free west coast of North America and moved inland from there (NatAm 8). Additional waves of migrants came later: Na-Dine Athapascans arrived in northern Canada around 9,000 years before present (BP), and Inuit moved across the Arctic 7,000 BP. However they arrived, it is clear that people were hunting, gathering food, and otherwise making a living in what is now the United States some 15,000 years ago. Flint-knappers produced different spear points for hunting large game, including the Clovis point which first appears around 13,000 BP. It was used across the plains and into what is now Wisconsin, and it proved so successful that some believe it caused a surge in the human population and a perhaps not coincidental decline in the number of large prey animals, including the extinction of entire species (NatAm 9). Evidence suggests that the Genessee Valley of New York and the upper Great Lakes experienced population increases around 5,000 BP as warming trends encouraged people to move north in search of water and cooler weather (NatAm 10). By 4,000 BP people lived all over North America, building longhouses and permanent fishing villages on the west coast, constructing mounds in the lower Mississippi, fishing and working with copper in the Great Lakes. Societies flourished and populations increased as agricultural and hunting techniques advanced. Squash, corn, and other cultivated grains became vital sources of nutrition. Healthier diets permitted the development of larger, more complex cultures as evidenced by the Adena and Hopewell burial and effigy mounds, constructed approximately 2,700 to 1,600 years ago. 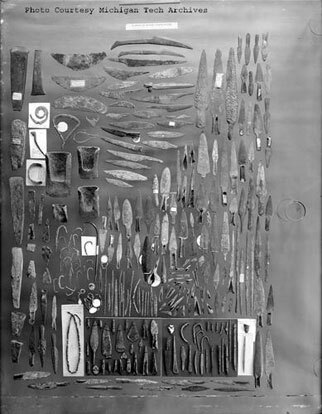 Hopewell people are also associated with distributing a wide variety of trade goods from a variety of places throughout North America, including obsidian, shells from the Gulf of Mexico, and Great Lakes copper. By the end of the first millennium, urban complexes were rising in the Southwest and in the Mississippi basin. Remnants of these societies are readily visible today in dwellings, ball courts, and kivas made of stone and adobe. A culture identified as the Middle Mississippian Tradition settled and built Cahokia – near present day East St. Louis – between the years 650 and 1450 AD; it has been estimated that at its peak between 1050 and 1250 anywhere from 8,000 to 40,000 people called it home. A permanent settlement was also established in Aztalan, Wisconsin by the Oneota variant of the Mississippian culture between 900 and 1300 AD (NatAm 11). These settlements ultimately declined prior to European arrival; it has been suggested that both disease and political events took their toll on the communities. Not a great deal is known about the pre-contact history of the Keweenaw, despite its acknowledged archaeological significance. Few scholars have examined the area, and when it is mentioned, descriptions are usually relegated to “peripheral commentary in general accounts of North American archaeology (NatAm 12).” Even so, we know that copper quarrying, mining, and fabricating has occurred here for thousands of years. An archaeological site in northern Keweenaw County containing copper beads, a crescent-shaped knife, awls, and a point has been dated to roughly 7,800 years before present; this indicates that people were here relatively soon after the last glacier retreated from the region (NatAm 13). Nearby in Minnesota, researchers found a copper spear point that is nearly 7,000 years old; this artifact represents the oldest verifiable archaeological evidence of metalworking in North America (NatAm 14). The people responsible for creating these and other copper objects lived in small, mobile groups and were familiar with the land and its resources (NatAm 15). While ancient cultures are difficult to reconstruct, the settlement at Aztalan, as well as several other pre-contact sites in Michigan and Wisconsin, may offer clues about Great Lakes’ society approximately 1,000 years ago, including the Keweenaw. Dwellings appear to have housed one family. They were rectangular or round, and were made of wattle-and-daub walls with bark or thatch roofs. Doors opened to the south, suggesting that the north wind was a factor in their design. Sleeping cots were pole frame, and covered with tamarack boughs, deer skins, and furs. A fire burned in the center of the structure, and a hole in the roof let smoke disperse. Food such as corn and berries were stored in woven bags and kept inside in pits; large and perishable items like deer, fish, and fowl were likely stored outside (NatAm 16). That archaeological sites are typically found near water indicates the importance of streams and rivers as a food source as well as a transportation medium. Researchers have suggested that a major trade center that flourished from around 1000 to 1450 AD at present-day Sault Ste. Marie (which existed earlier than that and continues today, albeit in a different context) brought thousands of people together several times a year; copper was undoubtedly one of the many items being traded (NatAm 17). We can assume that the Keweenaw’s residents participated in these gatherings. The arrival of Europeans as explorers and permanent settlers in the sixteenth and seventeenth centuries changed Native North America irrevocably. However, Europeans had been in contact with Natives for centuries before permanent settlements were built by the Spanish in the Southwest and the English, French, and Dutch along the Atlantic coast. Norse traders had established a post in present day Newfoundland, Canada as early as the year 1000, but the settlement was short lived (NatAm 18). They were followed by Basque whalers and fishermen who sought the cod-rich waters of the North Atlantic. Inuit, Micmac, and Maliseet descriptions of these encounters undoubtedly accompanied trade goods along the well-established routes that crossed the continent. Europeans arrived with many useful items, such as horses, axes, and cloth. However, they also imported diseases for which Natives had no immunity. This had catastrophic implications for every Native nation in North America. For example, Cortez and his conquistadors may have conquered the Aztecs in 1521, but the devastation did not end on the battlefield: It has been estimated that by the end of the sixteenth century, ninety percent of the population of Mexico’s central valley had died from illnesses introduced by the invading Spanish armies (NatAm 19). Further north, French explorers led by Jacques Cartier shared something contagious with Laurentian Iroquois that had all but annihilated their population by the turn of the seventeenth century (NatAm 20). The social upheaval caused by events like these altered political and economic landscapes, re-shaped allegiances, and had far-reaching implications on North American history (NatAm 21). By the time Jamestown was established (1607) and Quebec settled (1608), Native North America was already adapting to new realities created by the newcomers. Much about pre-contact populations remains largely unknown, but there is no confusion about the historic occupants of Michigan’s Upper Peninsula (UP). According to scholars, the UP was occupied by Menomini at the turn of the sixteenth century (NatAm 22). Their neighbors were Ojibway to the east, Winnebago to the south, and Dakota, Fox, Kickapoo, and Mascouter to the west. The Cree dominated lands north of Lake Superior. Although each was a distinct cultural group, they had in common a semi-nomadic way of life, occupying seasonal villages as hunters, fishers, and harvesters of wild rice. By 1608, maps indicate that territories had shifted, largely in response to their gradual displacement caused by Europeans acquiring – or appropriating – Native lands and the impact of European diseases. That displacement saw the Ojibway move into the UP, forcing the Menomini south. The Ojibway are an Algonquian-speaking people who once occupied more territory than any other Native group in North America (NatAm 23). Consequently, their history is rather complex. The Ojibway (also known as Chippewa) emerged from an earlier, ancestral group called the Anishinabe (“original person”). Anishinabe and Ojibway are at times used interchangeably in literature, but Anishinabe may also be used to refer specifically to the ancient ancestral Ojibway (NatAm 24). Bands then and now were united through networks of clans. Individual bands were identified by distinct names, such as the Amikwa, Saulteur, Marameg, and others. According to Ojibway tradition, their migration west towards the UP began much earlier than the sixteenth century, and several hundred years before French contact (NatAm 25). In fact, their move began around the same time that the Norse established their posts in Newfoundland in the tenth and eleventh centuries; tradition also explains that it was sparked by efforts to distance themselves from illnesses that had begun to impact their population (NatAm 26). The route took the Anishinabe from present-day New Brunswick, Canada, down the St. Lawrence, and around each of the Great Lakes. Near the base of Lake Huron, the Anishinabe split into three main groups: the Potawatomi; the Ottawa; and the Ojibway. Each group took a different direction; the Ojibway headed north to Manitoulin Island and both shores of Lake Superior. They likely arrived at the eastern end of Lake Superior some time during the late 1400s, and settled Spirit Island, Wisconsin during the 1500s. Conservative estimates date permanent Ojibway occupation of the western Great Lakes by the mid-to-late 1500s (NatAm 27). Life for the Ojibway was determined by the seasons and their environment, and revolved around acquiring and preserving enough food during the summer to support themselves through harsh winters (NatAm 28). In late fall, women built up stores of wild rice, maple sugar, and dried fish and game. Bands split into family units and traveled to winter hunting camps, which passed down from father to son (NatAm 29). Men cleared snow, collected wood, built wigwams, and traveled their territory to trap and hunt large game. Women would weave, sew, and repair fishing nets. In spring, the bands were ready to move to maple sugar camps; the sweetener could be stored and later used to flavor tea as well as stews and other main dishes. Spring was also the time to make birch bark canoes. By May, the bands would reunite close to rivers and lakeshores in large villages for the summer, where time was spent fishing, gathering plants, and gardening; potatoes, squash, and pumpkins were popular vegetables (NatAm 30). August was the time for collecting medicinal plants, picking berries, and gathering honey. It was also the time for harvesting and drying the wild rice that was a staple of the Ojibway diet. In early fall, men would go duck hunting and trapping, everyone would prepare to return to winter camps, and the cycle would repeat. Deer, beaver, and other animals were important, but it has been argued that as a Woodland people, plants formed the basis of almost all pre-contact Ojibway culture (NatAm 30). Even after European foods and tools were introduced, the Ojibway continued to make and use traditional plant-based implements, foods, and medicines. One example of their importance of plants in Ojibway culture is reflected in the exclusive Midewiwin society, whose members were trained to treat mental and physical illnesses through, among other things, the use of medicinal plants. This required an encyclopedic knowledge of native vegetation and reflects a deep understanding of the environment. The Midewiwin has its roots in Algonquian tradition and has been dated to proto-historic times; it, and the knowledge and practice of medicinal plants is still a part of Ojibway culture today (NatAm 32). The land not only provided the essentials of food and water, in many respects it also formed the foundation of their culture. In the 1650s, Ojibway informants told French explorers, priests, and traders that their ancestors were not the Keweenaw’s ancient copper miners (NatAm 33). This is to be expected as their arrival in the UP has been dated to the sixteenth century and, as we have seen, copper mining had been occurring for some 7,000 years before that. However, copper had incontrovertible significance in Ojibway culture: Jesuit missionaries document the spiritual beliefs the Ojibway had about the metal and the places in which it was found (NatAm 34). Nineteenth century records also confirm the spiritual and medicinal importance of copper. Pieces of copper would be carried in medicine bundles, and was particularly valued and revered; considered a sacred gift, offerings would even be left when copper was removed from the ground (NatAm 35). 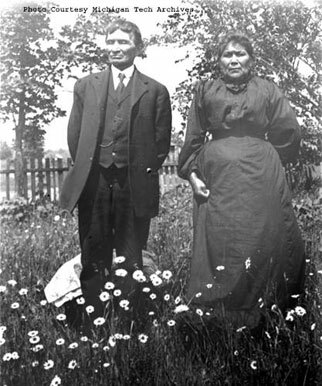 Johann G. Kohl lived with the Ojibway during the mid-1800s, and he noted that explorers and traders would ask them frequently for the locations of metal deposits (NatAm 36). Clearly, copper was important to the Ojibway and, given the number of artifacts that have been found in Historic Period archaeological sites, other Native groups continued to value it for its practical applications (NatAm 37). Regardless, new enterprises in the seventeenth century would draw everyone’s attention to different resources that would greatly impact North American history. In 1621, Samuel Champlain sent Etienne Brule on a mission to learn the Ojibway language and build a trading relationship with the many independent Ojibway bands (NatAm 38). They must have been persuasive, for by the mid-1600s the Ojibway had allied themselves with the French and were well-engaged in the fur trade. The Keweenaw was certainly rich territory: in 1659, the explorers and traders Pierre Radisson and his brother-in-law Medart Chouart Sieur des Groseilliers paddled along the south shore of Lake Superior to Keweenaw Bay, where they encountered an industrious population of beavers, pieces of native copper, and a convenient, well-established portage route that made traveling across the lake much easier (NatAm 39). Ten years later, Jean Talon, the man in charge of the colony of New France, sent Louis Joliet to “find the copper mine from which pieces of pure copper had been brought.” Although he failed to locate it, his journey was one among many which opened the door for French priests to establish thriving missions around Lake Superior (NatAm 40). The abundant resources of the Superior basin were great factors in the Ojibway’s success in the fur trade. Their role in the trade led to the establishment of many permanent communities, with key locations at La Pointe and Keweenaw Bay (NatAm 41). The creation of these settlements transformed their society from “formerly mobile bands into village-centered sociopolitical entities (NatAm 42).” Their success brought other changes, including challenges: the Iroquois, allies of the British, began encroaching on Ojibway territory from the east in the mid 1600s, sparking a war which the Ojibway eventually won in 1662 (NatAm 43). Events of the seventeenth and eighteenth century are characterized by war, threats of war, and growing complexities of expanding trade networks (NatAm 44). As the situation with the Iroquois demonstrated, acquiring and defending territory became extremely important when people competed for resources. This was made abundantly clear during the fur trade and European encroachment into Native lands. Relations between the Ojibway and the Dakota Sioux, Fox, Cree, and other neighbors were increasingly being defined by the politics, wars, and treaties between the French and the British and their Native allies. Much like the cat’s cradle string game, alliances – and territorial rights – were often complex and constantly shifting. For instance, wars in Wisconsin and Minnesota in the eighteenth century displaced the Fox and Dakota Sioux, and solidified Ojibway control over lands to the west of Lake Superior. Compounding the commercial and diplomatic complexities were epidemics of smallpox, whooping cough, and influenza that weakened Native populations and threw societies into turmoil. Undoubtedly, one of the complications for the French in their relations with the Ojibway was recognizing that even though the Ojibway were united by ties of kinship and trade, the bands remained relatively autonomous; by the early 1700s, the villages of the Lake Superior Ojibway were becomingly increasingly independent. One cannot overestimate the impact of the fur trade and its concomitant politics on the Ojibway of the Great Lakes. The Ojibway developed a close relationship with the French, who often married Ojibway women; family relationships tended to build trust and make negotiating trades and treaties easier for both sides. Being allies of the French affected Ojibway relations with neighboring Native groups, particularly if they happened to be allied with the British. This situation was made even more apparent after the French and Indian War, when the French ceded their North American land holdings to the British in the Treaty of Paris (1763). Relations between the British and Ojibway were not good, and the Ojibway began to focus on protecting their land from the Keweenaw Peninsula westward, and south to the Mississippi Valley (NatAm 46). By the late 1700s, life for the Ojibway had taken yet another turn; even more profound changes would occur in the nineteenth century. Today, there are multiple self-contained Ojibway reservations and communities around the Great Lakes. This is a reversal from historic conditions in which, as indicated previously, they controlled more North American territory than any other Native group. In the Lake Superior region, Ojibway territory spanned parts of Michigan, Wisconsin, and Minnesota; the Ojibway ceded much of this land to the US government in the 19th century in a series of four treaties (1836, 1837, 1842, and 1854) (NatAm 47). Today, while the entire Keweenaw Peninsula is historically and culturally significant to the Ojibway, their local, modern political landscape is largely captured within the limits of the Keweenaw Bay Indian Reservation (NatAm 48). The decline of the fur trade in the nineteenth century coincided with European settlement on Native lands. The effects of these shifts were soon felt in the western Great Lakes. The young U.S. government had made attempts to mediate settlement as early as 1787 with the Northwest Ordinance, but its provisions to protect Native interests were disregarded (NatAm 49). Adding insult to injury the British, who themselves were trying to win back territory, encouraged the Ojibway and Ottawa to attack settlements in Ohio, only to turn their backs when their support was requested. The Treaty of Grenville (1795) established another boundary beyond which settlers were not allowed, but by 1802 this too had been crossed. In 1822, the government established the Commission of Indian Affairs. Lewis Cass was named the Superintendent of Michigan, Wisconsin, and Minnesota, and Henry Schoolcraft the Indian Agent at Sault Ste. Marie (NatAm 50). This ushered in a period during which more Native lands were ceded and reservations established. At the same time that the Ojibway and others were negotiating for territory – and losing ground – with the government, their need to hold on to their lands was growing. The fur trade, which had supported communities for over 150 years, was waning; over-hunting and trapping depleted once-plentiful beaver and other fur-bearing animals around the Great Lakes. In fact, in 1832, the Ojibway of Keweenaw Bay were said to be completely dependent on the fur trading company for their goods (NatAm 51). To borrow an apt cliché, Natives found themselves between a rock and hard place: they needed to return to traditional hunting and gathering to support themselves, but their ability to do so was compromised by their shrinking domains and scarcity of game (NatAm 52). In addition, some Ojibway were compelled to sell their land in order to pay off debts incurred with fur traders. Exacerbating these events between 1830 and 1835 were harsh winters and outbreaks of serious illnesses that further threatened both animal and human populations. Treaties were negotiated and renegotiated, but all had the same end result: settlers moved in, and land was traded for promises of money, schools, and other supportive measures that the government only partially fulfilled (NatAm 53). This created difficult living conditions for Ojibway living on and off reservations. It was not until the twentieth century that many of these inequalities would even begin to be addressed. In addition to accommodating westward expansion, copper was one of the main reasons the U.S. government was intent on acquiring Ojibway land in the Upper Peninsula. In 1822, Schoolcraft wrote of the copper-rich territory that “[w]ith respect to the practicability of extinguishing the Indian title, no difficulty is to be apprehended (NatAm 54).” The government tried to negotiate for subsurface mining rights on the Keweenaw in 1826, and ultimately succeeded in doing so with the Treaty of 1842. It is at this point that most histories of the Keweenaw begin. However groundbreaking Euro-American exploration, mining, and settlement are, they must be seen as subsequent chapters of a story that was started thousands of years ago by Native people, and centuries earlier by the Ojibway. Knowing how important the environment was to the Ojibway, it should come as no surprise that any environmental and landscape change influenced their culture. The fur trade prompted them to adapt traditional hunting and trapping methods in order to meet the demand for furs and to acquire European goods. Their territory shrank when Euro-American settlers arrived, which impacted traditional land use patterns. The impact was magnified when they were moved to reservations. Even though they were guaranteed off-reservation hunting, fishing, and gathering rights, their very way of life was being threatened. Every culture is dynamic and adapts in the face of change. Yet there are connections to the past. The Ojibway continue to value wild rice as a staple of their diet, the Midewiwin continue their role as healers, and the tribe continues to gather in the summer – the annual summer powwow attests to that. Oral traditions preserve their cosmology. Their stewardship of the land has also continued for hundreds of years, making them, in a sense, the Keweenaw’s oldest immigrant group; knowing their story and their connections to this exceptional place enhances an understanding of a shared landscape. Copper was valued long before it covered ships’ hulls, adorned the domes of state capitols, and carried electrical currents. Thousands of years ago, it played an important role in acquiring food and clothing in the form of projectile points, fishhooks, knives and awls. Copper beads and ornaments imply that it also had a social function. Its distribution over much of the North American continent demonstrates that it had economic value as well; extensive trade routes carried Lake Superior copper as far away as Louisiana and Alberta, Canada (NatAm 55). Finally, Ojibway oral tradition, as well as the fact that it long appears in burial contexts, suggests that it served a spiritual purpose (NatAm 56). That copper played such an important role in the nineteenth and twentieth centuries is no surprise. Neither should it be a revelation that it drew people to the Keweenaw for thousands of years before European contact. More research on the Ojibway and their predecessors in the Keweenaw needs to be conducted and published. As the Ojibway migration story demonstrates, oral traditions of the Menominee, Sioux, and Fox may help us gain a more complete picture of historic and pre-contact events. Other primary sources should be examined and interpreted for their bearing not only on the development of nineteenth century industry, but for their relation to the Native experience. Ojibway connections to the 20th – and 21st – century landscape should be examined. As Trigger and Washburn charge, we will never fully understand history if its participants are described in isolation from one another; the rich ethnic history of the Keweenaw, and the Ojibway’s role as the area’s first immigrants, attest to that. 1900. 2nd Ed. Cambridge: Cambridge University Press, 2004. Great Lakes Indian Fish and Wildlife Commission. “Treaty Rights,” 2004 Edition. Odanah, Wisconsin: Great Lakes Indian Fish and Wildlife Commission, 2003. State. Bloomfield Hills, MI: Cranbrook Institute of Science, 1999. Mines. New York: Oxford University Press, 1991. Superior Basin. Detroit: Wayne State University Press, 1999. American Tradition in the Lake Superior Region. Minneapolis: University of Minnesota Press, 2000. Sauer, Carl O. Seventeenth Century North America. Berkeley: Turtle Island, 1980. Peninsula. Detroit: Wayne State University Press, 1994. Prepared for the National Park Service by the Bureau of Applied Research in Anthropology, the University of Arizona in Tucson. (NatAm 1) Susan Martin, Wonderful Power: The Story of Ancient Copper Working in the Lake Superior Basin (Detroit: Wayne State University Press, 1999), 78. Martin’s book is one of the very few that offers a comprehensive, scholarly examination of the area prior to European arrival. (NatAm 2) One of the problems for archaeologists in the Keweenaw is that industrial mining operations were built directly over pre-contact sites, thus obliterating evidence of pr e-contact occupation and mining. This is compounded by modern collectors and hobbyists who also destroy the integrity of sites by finding and removing artifacts from their original locations. One can only guess at the amount of information we have lost, and the number of questions that will remain answered, because of these activities. See Wonderful Power for a discussion of this issue. (NatAm 3) Wilcomb E. Washburn and Bruce G. Trigger, “Native Peoples in Euro-American Historiography,” in The Cambridge History of the Native Peoples of the Americas, vol. 1, North America, Part 1, eds. Bruce G. Trigger and Wilcomb E. Washburn (Cambridge: Cambridge University Press, 1996), 62. (NatAm 4) Russell Magnaghi addressed this in his work A Guide to the Indians of Michigan’s Upper Peninsula 1621-1900 (Marquette, MI: Belle Fontaine Press, 1984). The publication provides a welcome chronology of events relating to Native North Americans, but no analysis; the author intended his work to be a starting point and guide for future studies. 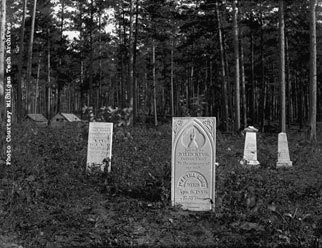 (NatAm 5) See Larry D. Lankton, Cradle to Grave: Life, Work, and Death at the Lake Superior Copper Mines (New York: Oxford University Press, 1991) and Arthur W. Thurner, Strangers and Sojourners: A History of Michigan’s Keweenaw Peninsula (Detroit: Wayne State University Press, 1994). Lankton’s approach is temporal, and his focus is on industry, while Thurner is more spatially oriented and presents a history of the peninsula itself. Thurner also offers a more detailed look at Ojibway culture. (NatAm 6) Lankton, Cradle to Grave, viii. See also Larry D. Lankton and Charles K. Hyde, Old Reliable: An Illustrated History of the Quincy Mining Company (Hancock, MI: The Quincy Mine Hoist Association, Inc.), 1982. (NatAm 7) Henry F. Dobyns, “Introduction,” in The Settling of North America: The Atlas of the Great Migrations into North America from the Ice Age to the Present, ed. Helen Hornbeck Tanner (New York: Macmillan, 1995), 12. The author makes that claim with reference to the Meadowcroft Rockshelter near Pittsburgh, Pennsylvania, which has been radiocarbon dated approximately 19 thousand to 13 thousand years BP. Although experts debate the dates, it is certainly among one of the oldest archaeological sites in North America. See http://www.mnsu.edu/emuseum/archaeology/sites/northamerica/meadowcroft.html for more information. (NatAm 8) The Settling of North America, 12. (NatAm 9) The Settling of North America, 20. Scientists debate the role humans played in the Pleistocene extinctions, as there were likely many factors that influenced the process. For example, the use of Clovis points seems to have coincided with a drought that likely negatively impacted large game populations. (NatAm 10) The Settling of North America, 22. (NatAm 11) Dates and population estimates were obtained from The Settling of North America, 26-27, and online at Wikipedia, 6 September 6, 2005. See http://en.wikipedia.org/wiki/Cahokia and http://en.wikipedia.org/wiki/Aztalan_State_Park,_Wisconsin for more information. (NatAm 12) Susan Martin, Wonderful Power: The Story of Ancient Copper Working in the Lake Superior Basin (Detroit: Wayne State University Press, 1999), 16. (NatAm 13) Susan Martin, Wonderful Power: The Story of Ancient Copper Working in the Lake Superior Basin (Detroit: Wayne State University Press, 1999), 142. See also John R. Halsey, ed., Retrieving Michigan’s Buried Past: Archaeology of the Great Lakes State (Cranbrook Institute of Science: Bloomfield Hills, Michigan, 1999), 183-184. (NatAm 14) Susan Martin, Wonderful Power: The Story of Ancient Copper Working in the Lake Superior Basin (Detroit: Wayne State University Press, 1999), 143. (NatAm 15) Susan Martin, Wonderful Power: The Story of Ancient Copper Working in the Lake Superior Basin (Detroit: Wayne State University Press, 1999), 153. (NatAm 16) http://en.wikipedia.org/wiki/Aztalan_State_Park,_Wisconsin See also Martin for a thorough discussion of Great Lake’s human occupation patterns of various archaeological time periods. (NatAm 17) The Settling of North America, 28. (NatAm 18) Visit http://whc.unesco.org/pg.cfm?cid=31&id_site=4 for more information. (NatAm 19) The Settling of North America, 34. (NatAm 20) The Settling of North America, 42. (NatAm 21) For the definitive discussion of the impact of European diseases on aboriginal populations, read Alfred W. Crosby, Ecological Imperialism: The Biological Expansion of Europe, 900-1900. 2nd Ed. (Cambridge: Cambridge University Press, 2004). (NatAm 22) The Settling of North America, 31. (NatAm 23) M. Nieves Zedeño et al., “Final Report: Traditional Ojibway Resources in the Western Great Lakes: An Ethnographic Inventory in the States of Michigan, Minnesota, and Wisconsin,” (University of Arizona in Tucson, Bureau of Applied Research in Anthropology, 2001), 27. (NatAm 24) M. Nieves Zedeño et al., “Final Report…”, 26-27. According to Ron Morton and Carl Gawboy, the form depends on the subject: ‘Ojibwe’ is used when discussing cultural things, ‘Chippewa’ in political and formal contexts, and Anishinabe ‘is what the Ojibwe call themselves, one Ojibwe to another.’ See Ron Morton and Carl Gawboy, Talking Rocks: Geology and 10,000 Years of Native American Tradition in the Lake Superior Region (Minneapolis: University of Minnesota Press, 2000), 67. (NatAm 25) Zedeño et al., 26. (NatAm 26) Zedeño et al., 26. (NatAm 27) Zedeño et al., 28-29. (NatAm 28) Zedeño et al., 42-43. Unless otherwise indicated, all ethnographic information comes from the Ojibway ethnography prepared by Zedeño et al. (NatAm 29) Morton and Gawboy, 73. (NatAm 30) Morton and Gawboy, 71. (NatAm 31) Zedeño et al., 50. (NatAm 32) Zedeño et al.., 48. (NatAm 33) Arthur W. Thurner, Strangers and Sojourners: A History of Michigan’s Keweenaw Peninsula (Detroit: Wayne State University Press, 1994), 20. (NatAm 34) Zedeño et al., 66. (NatAm 35) Zedeño et al., 67. (NatAm 36) Zedeño et al., 67. (NatAm 37) Much like historians, who organize the past into time periods of similar cultures and events in order to aid our understanding of the past (for example, the Middle Ages, the Renaissance, and the Gilded Age), archeologists divide prehistory into a chronology of traditions based on similarities and differences in materials found at archaeological sites. Traditions are further divided into phases. Broadly speaking, the Paleoindian tradition begins approximately 9500 years before present (BP), and leads into various stages of the Archaic tradition (roughly 8000 BP) and the Woodland tradition (some 2000 BP). During the Historic tradition (500-1000 BP), many of the First Nations we know today were established. See Martin, 142. (NatAm 38) Carl O. Sauer, Seventeenth Century North America (Turtle Island: Berkeley, 1980), 121. See also Russell M. Magnaghi, A Guide to the Indians of Michigan’s Upper Peninsula (Marquette, MI: Belle Fontaine Press, 1984), 1. (NatAm 39) Sauer, 123. According to Radisson, the beavers had felled so many trees that there was not enough to build a fire. The portage route is followed to this day, but by the Portage Lake ship canal instead of overland trail. (NatAm 40 )Sauer, 132-133. One of the early missions included Saint-Esprit, which was established by Father Claude Allouez in 1655 for the Ottawa and Huron living at Chequamegon Bay in 1665. Another Jesuit missionary, Father Rene Menard, tried to establish a mission at Keweenaw Bay in 1661 but was unsuccessful. See Magnaghi, 2-3. (NatAm 42) Zedeño et al., 30. (NatAm 43) Zedeño et al., 32. (NatAm 44) Magnaghi’s work offers a comprehensive chronology that will not be duplicated here. (NatAm 45) Zedeño et al., 36. (NatAm 46) Zedeño et al., 36. (NatAm 47) It is important to recognize that treaties are legally binding agreements made between sovereign nations. Understanding treaty history is complicated by their number, purposes, and the territories to which they pertain. The Treaty of 1836 concerned land in the Upper and Lower peninsulas of Michigan; 1837’s ceded territory in parts of Wisconsin and Minnesota; 1842’s ceded land in northern Wisconsin and the western UP, including the Keweenaw Peninsula; and the Treaty of 1854 ceded land northeast Minnesota. Many reservations were also created by this treaty. Tribal rights to fish, hunt, and gather on ceded lands were important guarantees of many treaties, including the Treaty of 1842. See the Great Lakes Indian Fish & Wildlife Commission publication “Treaty Rights,” 2004 edition. (NatAm 48) The Keweenaw Bay Indian Community (KBIC) was established in 1936; the Keweenaw Bay Reservation was developed in 1854 following the Treaty of 1854. See “Treaty Rights” and www.coppercountry.com/KBIC.php for information about the establishment of the community and reservation. (NatAm 49) Zedeño et al., 37. (NatAm 50) In 1836, Schoolcraft received complaints for unfairly distributing treaty goods to his Ojibway in-laws; Schoolcraft’s wife, Jane Johnston, was the daughter of Wabo-jeeg, an Ojibway chief. See Magnaghi, 43. (NatAm 53) Zedeño et al., 39. (NatAm 54) Henry Schoolcraft, as cited in Magnaghi, 36. (NatAm 55) A small piece of native copper was recovered from a burial site in south-central Alberta that dates from 2800 years BP, and is currently on exhibit at the Royal Alberta Museum in Edmonton. Analysis at the University of Alberta confirmed that it was native copper from the Great Lakes. According to Jack Brink, archaeologist at the Museum, the piece was likely “traded through intermediary cultures into the northern plains.” Email correspondence with Jack Brink, 1 September 2005.